White Wine Sangria, Thyme for Cooking. 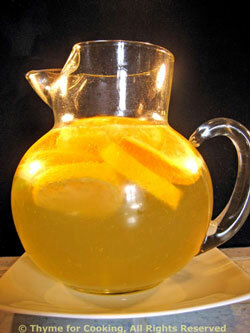 In a large pitcher mix the wine, water, peach liqueur, and sugar. Stir well to combine. Slice the fruit and remove pips. Squeeze each slice into the sangria, then drop it in. Stir well to combine the sugar and rest of ingredients. Add lots of ice and serve.